Guild Anderson Furniture are a dynamic, young design business offering a comprehensive service designing and making furniture to order. Specialising in bespoke kitchen cabinetry and with a broad experience in country houses, Guild Anderson are often asked for their advice on the perfect paint colour scheme. The colour consultancy service is free but reserved for clients only. Guild Anderson’s colour consultancy is headed up by founding partner and Marketing Director, Hannah Anderson. How does Guild Anderson’s paint consultancy work? Consistent with the company’s practical, low-key approach, Hannah describes the paint advisory service as ‘more of an informal, palette suggestion, rather than a full-on interior design solution.’ Written about in a previous blog, http://www.guildandersonfurniture.co.uk/perspectives-paint-colour, the colour consultancy was launched last year and has been a notable success with 7 out of the last 10 projects taking up the offer of help with colour schemes. Fitting in with Guild Anderson’s mission to offer as seamless a customer service as possible, the motivation to provide clients with a colour support service was a natural extension to the company’s personal approach to project management. And seamless it certainly is. 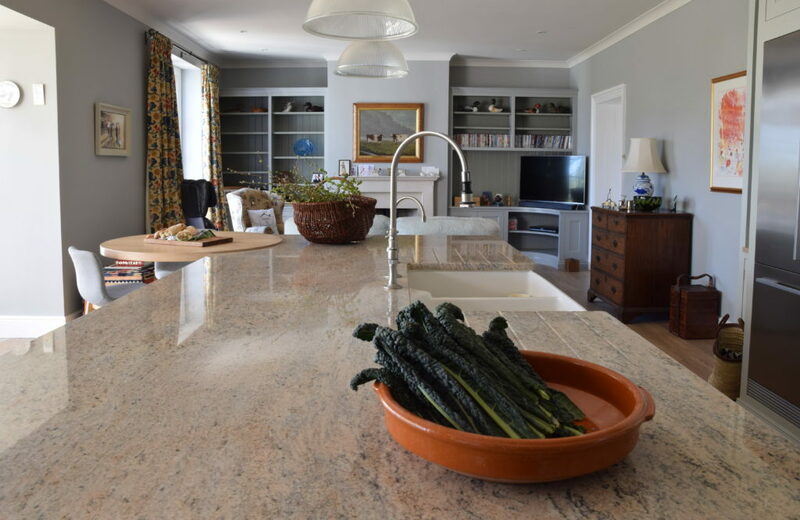 Based from the new Guild Anderson Design Studio in Tisbury, their 360’ service extends far beyond a basic kitchen design and installation: the design team work closely with clients selecting which worktops, flooring, handles and appliances will work best for their new home. Rifling through paint charts may seem fun, but when it comes down to actually making a decision and committing to a scheme involving different colours in several rooms, it can be fairly daunting and hard to know how to narrow down the choice. How does Guild Anderson’s Paint Colour Consultancy service work? The starting point is a visit to the client so that Hannah can see the room and how the light falls. She explains, ‘While it’s possible to give clients advice from a photo, the positioning of light from the windows is so important, it is always better to just be there. Natural light is very different from ceiling lights or table lamps. It can affect the paint colour hugely if there is a window, say, at both sides of a room. What is wonderful with the better quality paints, is the variances are greater so a colour will look quite a different if choosing the same paint as a friend. We spend quite a lot of time double checking ourselves as we can never believe a paint is the same one, it can look so very different from one home to another.’ From this initial visit, Hannah will gain an idea of what a client likes and doesn’t like, the sort of look they are after. From this, she usually presents two to three different palette selections. Colour as much as design is proving to be Guild Anderson’s forte. The appeal of Guild Anderson kitchens is the perfect balance: it is partly the well designed layout to the room, the clear quality of the cabinetry, but also the colours which should all be in concert with one another. Guild Anderson have certainly made quite a name in the industry for their sense of style. Evident in the quality and design and cabinetry work, but also for their selection of finishes – handles, stone worktops – and now for their well-chosen paint combinations. Favoured palettes echo Guild Anderson’s ‘classic yet contemporary’ approach to design. Typically, this translates as being paint colours that are elegant with depth and yet are both understated and easy to live with in tone.